Last year, indie filmmaker Trey Edward Shults hit the ground running with his feature debut Krisha, an interesting and affecting experiment about a recovering alcoholic who returns home to celebrate thanksgiving with her estranged family. The movie itself walked the line between drama and comedy, but the approach that Shults took towards his storytelling was a dark and dreadful one, so much so that fans and critics alike agreed that he should do a horror film next. Apparently, Shults also agreed, because his new movie is the spook flick It Comes At Night. 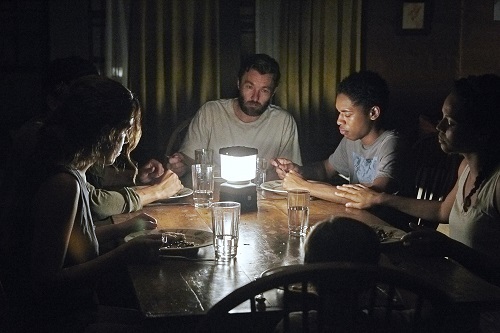 Set in a post-apocalyptic world where humanity has been ravaged by some sort of viral sickness, It Comes At Night is about a man named Dan (The Gift‘s Joel Edgerton) who has taken refuge in a secluded cabin in the woods with his wife, Sarah (Carmen Ejogo from The Purge: Anarchy) and son, Travis (Kelvin Harrison, Jr. from The Birth of a Nation). One night, Dan catches a stranger named Will (Christopher Abbott from James White) breaking into the cabin. After interrogating him, Dan learns that Will was just looking for food for his wife, Kim (Mad Max: Fury Road‘s Riley Keough) and infant son, Andrew (newcomer Griffin Robert Faulkner). Will convinces Dan to trust him, and Dan allows Will’s family to move into the cabin for safety. Of course, with that many people in a confined space, things get complicated quickly. And that’s not even considering the threat outside in the forest. There are two movies at work in It Comes At Night, and the story sometimes can’t decide which one it wants to follow. It starts off with the threat being an external one, with the virus and whatever else may be outside the house as the primary antagonist (Dan gives everyone who’ll listen a stern warning about leaving the house alone, and never at night!). Once Will and Kim show up, the theme of the movie becomes one of mistrust and paranoia, with Dan second guessing his decision to let outsiders in and wondering about whether or not his trust will be betrayed. It Comes At Night is a slow build, with the entire first half of the movie giving its audience the impression that it hasn’t even begun yet. But, once it figures out which movie it wants to be, it commits fully and does not let up. It Comes at Night is an exercise in mounting tension. Actually, it’s a masterclass. Shults does basically the same thing that he did with Krisha, piling more and more narrative kindling onto the cinematic fire so that it gets hotter and hotter over the course of the movie, but with It Comes at Night, the stakes are higher, so the filmic heat is more intense. 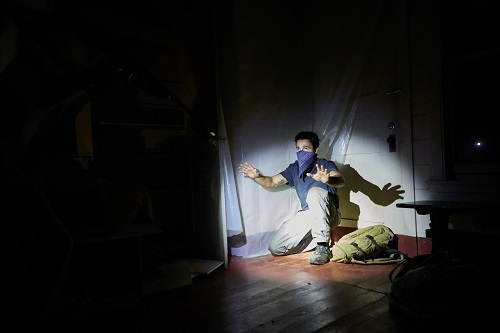 Everything about It Comes at Night is purposely unnerving, keeping the viewer on guard waiting for the next shock or start that may or may not come. It’s that kind of a movie. There is a certain amount of work that has to be done by the viewer with It Comes at Night, and even then, there are more than a few questions that are left unanswered. But that’s the point – the priorities of the storytelling shift, and with them, the needs for certain things to be explained change. The backstory behind whatever plague has taken over the world or whoever (or whatever) is lurking in the woods stops mattering when more immediate threats materialize. And the mystery that is forgotten makes whatever is out there more ominous. It Comes at Night is not going to please everyone. There will be detractors who mistake the slow-burn suspense for nothing happening. There will also be those who will lament the lack of volume-oriented jump scares. That’s okay; It Comes at Night isn’t for them, it’s not that kind of movie. Horror fans with patience and who can appreciate a bit of restraint will go away feeling satisfied, albeit possibly a bit perplexed. One of the most unsettling elements in Krisha was the cinematography, and Shults used the same director of photography, Drew Daniels, to shoot It Comes At Night. 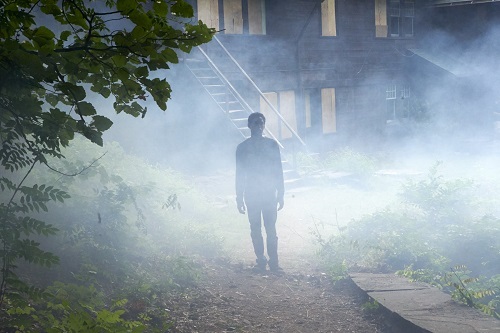 Because of this, It Comes At Night has the same creepy and voyeuristic visual style. The camera is very observational, fluid and handheld to the point of almost being shaky, giving the audience the impression that they are witnessing private moments between the characters that they shouldn’t be seeing. The camera takes are long and uncomfortable, sometimes following characters or giving point of view shots, but other times just swaying from character to character while they talk, spinning around the action instead of being right in the middle of it. The keyhole-peeping-esque photography goes a long way towards the overall discomfort that It Comes At Night generates in its viewer. The soundtrack is another reason why It Comes At Night is such a powerfully unsettling film. There is a score, composed by Brian McOmber (another one of Shults’ Krisha collaborators), but it works in tandem with the sound design of Kris Fenske (who has contributed audio to everything from Apollo 18 and R.I.P.D. to The Hunger Games and The Revenant) to formulate a freaky and disturbing, all-encompassing soundscape. Instruments like strings and harmonicas blend with the sounds of wind and leaves to create a falsely quiet, ever-present eeriness that permeates the entire film. It’s just one big sonic echo chamber of dissonance and discordance hovering around the characters. If the visuals give the audience a second to relax, the audio immediately takes it away. The sound design in It Comes at Night is sneaky in how it subliminally ratchets up the suspense. Like The Witch and The Blackcoat’s Daughter, It Comes at Night is one of the new breed of independent horror films that creates fear through atmosphere and mood rather than through cheap tricks. 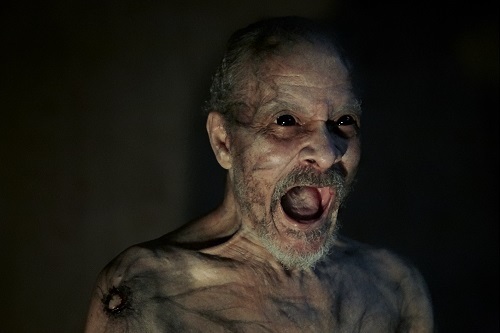 There are a handful of jump scares, but mostly, It Comes at Night just radiates a deep sense of dread through its combination of sound and images. The feeling of despair and terror is complicated by the fact that there is no clear antagonist in the film; the underlying threat to the family is completely ambiguous. Really, the scariest thing about It Comes at Night is the darkness…and that’s compliment. It’s not typical-horror movie scary – there are no uncomfortable laughs after the audience is tricked into flinching. There’s nothing fake or manufactured about the scares in It Comes at Night. The film will haunt you if you let it.